Students were given a set of parameters to create their own jack o’lanterns with precise measurements. The instructions included the height and width of specific shapes, such as squares and triangles, and distances between each. The first day they spent time making careful estimates on weight, circumference, and diameter of the pumpkins. After each estimate students made an actual measurement and then calculated the difference between the estimate and actual. They focused on customary and metric units, as well as volume and capacity. After carefully plotting their spooky designs, they then received a little help from a few big buddies on campus. 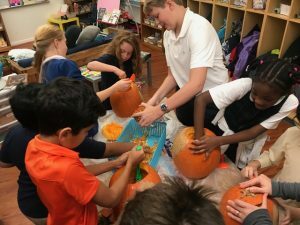 A team of seventh graders helped the third graders scoop out the insides of their pumpkins and prepare for carving. Third graders then completed the project by carving their very own jack o’lantern.